If you think you know about every crazy, wild, out of the world staycation there is to offer, well, think again. You can now check ‘glamped on the world’s largest salt flat' off your bucket list, thanks to Kachi Lodge. The Kachi Lodge stands directly on the Salar de Uyuni, which is situated on the foot of Tunupa Volcano in Bolivia. In case you missed it, the Uyuni Salt Flats are now one of the largest salt flats on the planet and a relatively obscure but remarkably striking tourist destination. If you happen to stay there during the rainy season, you can catch the phenomenal sight of the heavens falling as the beautiful blue sky is mirrored on the salt flats, transforming the white expanse into a mirage. But alas, rain or no rain, the sheer vastness of the Salar is definitely worth investing in a good camera for. 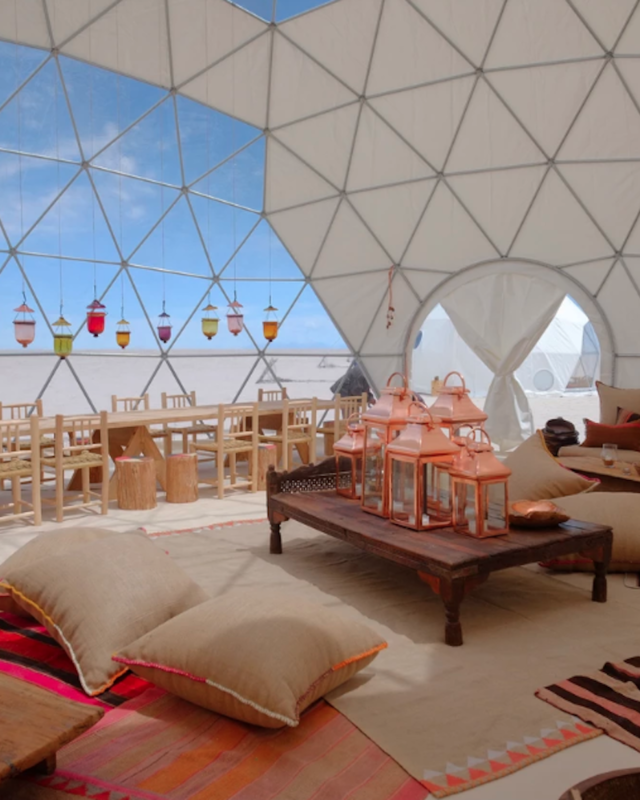 Rather than just take a day trip to Uyuni like most people, you can actually stay on the salt flats in your own little igloo-like dome. At first glance, you might think it’s a bunch of domes on the moon, or a space station on another planet, but rest assured these are just a (not so short) plane ride away. Inside your dome, you’ll get all the facilities of a hotel room, including a private bathroom with running hot and cold water, a luxurious double bed and clear-panelled windows that are carved out to give you the perfect views of the mighty salt crust. The central dome features a breathtaking, vibrant common space, with a dining area and floor level couches in case you just want to relax and get to know your dome-mates. If the stillness of the salt flats works up your appetite, you can enjoy some delicious, authentic Bolivian eats courtesy of the award winning Gustu Restaurant. If you want to make the most of your trip (and are up for a challenge) you can hike off to the lower tip of the Tunupa volcano crater or visit the morbidly delightful Coquesa village and its mummies. If you’re not keen on visiting the dead, stay back and borrow Kachi’s mountain bikes to experience the flatness of Salar’s white earth. At night you can use the in-house telescope to observe the magnificent night starry skies of the Bolivian plateau. We can’t recommend a better date night. If there’s any place we’d recommend you break the bank for, it’s the Kachi Lodge. The resort, which just opened in February 2019, only has 6 six luxury domes, so we suggest you make your booking way ahead of time. After all, isn’t this the stuff that dream journals are all about? Want to get some more extravagant experiences under your belt? Check out these next level trips to take with your bestie.